My favorite fairytales have always been those with a dash of edge and darkness, namely, told by the brothers Grimm. For this reason I was intrigued by the premise of Porcelain: A Gothic Fairytale. Published by Improper Books, Porcelain is presented by the company’s two founders, writer Benjamin Read and illustrator Chris Wildgoose, who offer a graphic novel constructed with an eerie, somber love story and a hint of the macabre. When a street urchin is pressured by others into scaling a high wall and stealing from the “wizard” on the other side, she reluctantly complies. What she discovers beyond the wall is a gentle old alchemist who, after having lost a loved one, has dedicated his life to the creation of “Runes”: animated beings made of porcelain and crushed bone. Now dwelling in a genuine living doll house, the ragamuffin is addressed simply as “Child” and becomes a surrogate daughter of sorts to the man known only as “Uncle.” Feeling trapped as time passes, Child quickly learns that the kind inventor is actually a lonely old man longing for just a flicker of happiness and that not all is clear cut within the confines of her new world. Mr. Read carefully weaves an exquisite tale of love, betrayal, and the costs of both. Wildgoose brings the graphic novel to life with an array of blues, reds, and grays that help solidify the dark and bizarre, yet beautifully drawn world that Child is thrust into. From the cold rooftops of the Victorian era city on the first panel, to the creepy, gothic gates of the porcelain maker’s home, to the first words, “This is a bad idea,” spoken from an unseen character, I knew that both Read and Wildgoose would have no trouble pulling me into the world of Porcelain. 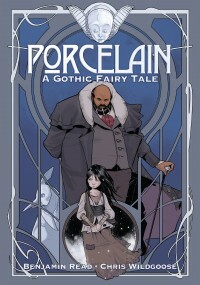 Porcelain: A Gothic Fairytale is a refreshing read. This graphic novel will leave you unnerved and engrossed in its humanity, honesty, and peculiarity. I can only hope that the other titles from this creative team and those at Improper will live up to this haunting tale.